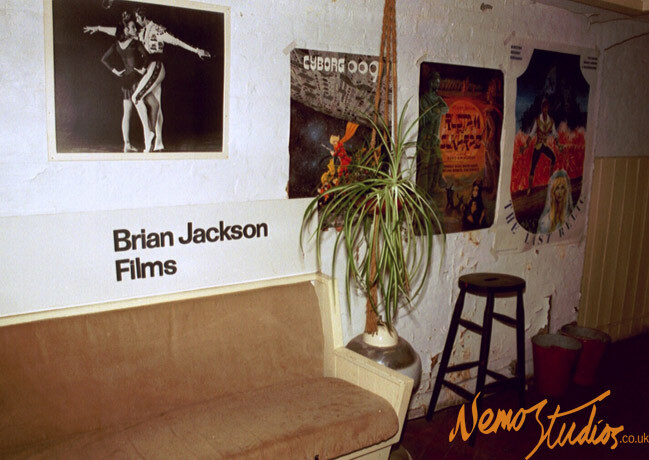 Nemo Studios was located on the top floor of a 19th-century school building. 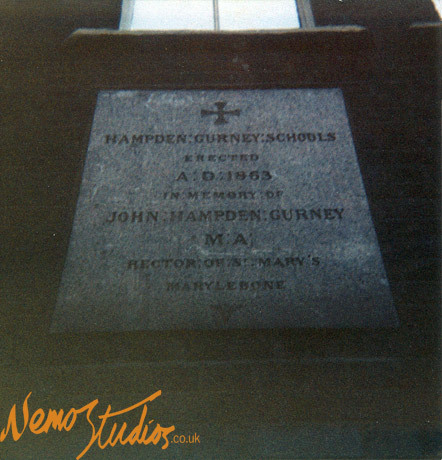 The building was erected, in memory of Reverend John Hampden Gurney, in 1863, and it was first used as an Anglican girls' school. After being used as a school for over a century, the historic building became available to rent, and, subsequently, it became Hampden Gurney Studios, where it was used for a variety of commercial purposes. 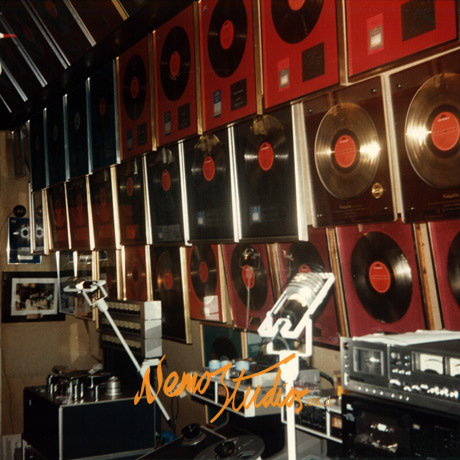 In 1975, Vangelis leased the top floor of the property, where he established his sound laboratory, and he used these premises for the next 13 years. 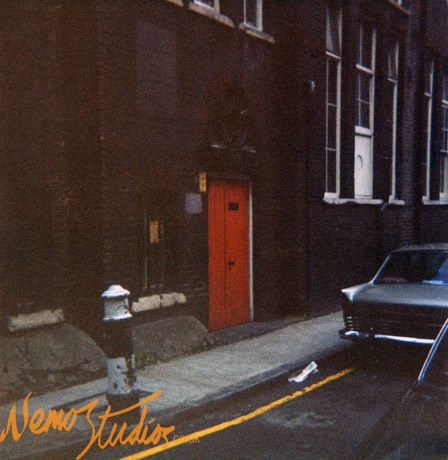 For anyone unfamiliar with Nemo Studios, the building’s external appearance hid any clue that it could be a high-tech recording studio. The unassuming brown-brick structure was tucked away in a quiet alley close to Edgware Road, near Marble Arch, in London’s bustling city centre. 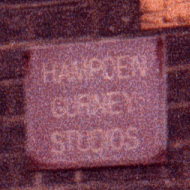 The Victorian building was known to passers-by as Hampden Gurney Studios. 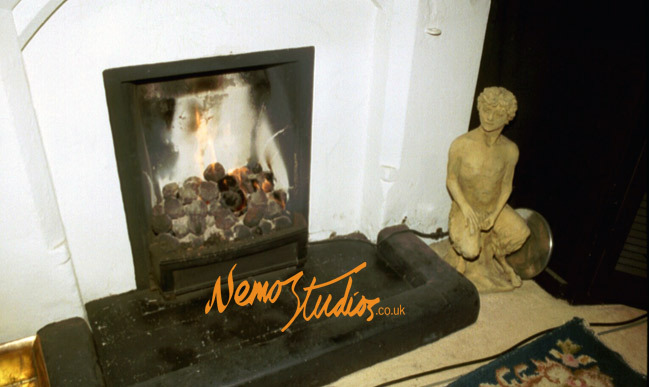 A couple of commercial enterprises took up residence at the building, and Nemo Studios occupied the entire top-floor area. 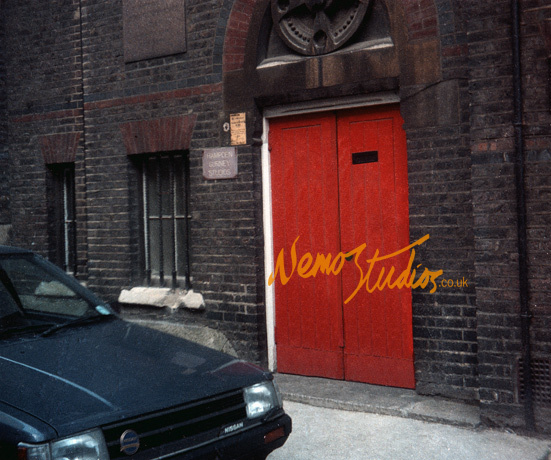 Nemo Studios was located on the floor above the six tall windows, which are shown on the right-hand side of the red door. The other three tall, thin windows above the entrance belonged to the stairway. The school was erected in honour of Reverend H Gurney. By 1968, the school had moved to another location and the building was turned into a film production centre and photographic studio. 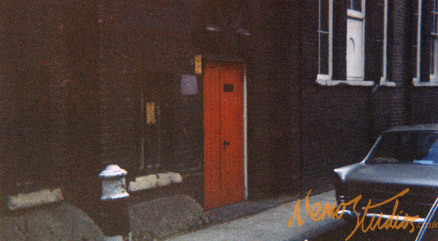 Behind the building’s red, wooden doors was a U-shaped stairway which led to a hallway on the first floor. There were sofas on the first-floor staircase landing, which served as a waiting area. From this landing there was a door leading off into the office of a film production company. 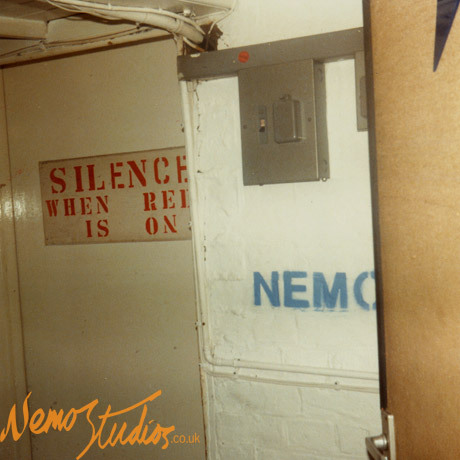 Another door led into Nemo Studios’ first tape storage room, and, finally, there was a staircase to the top floor, which led directly into Nemo Studios. 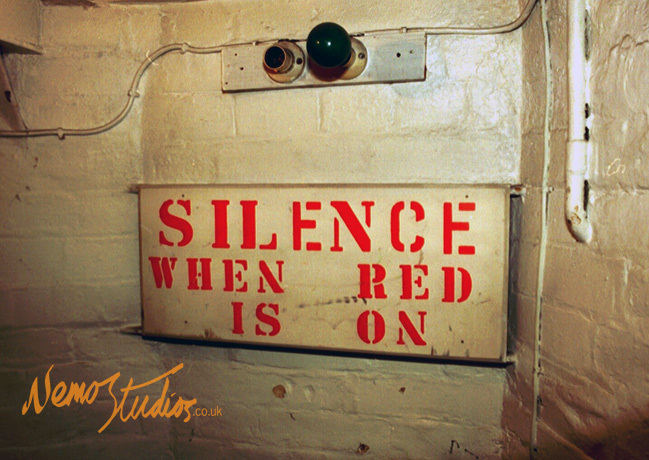 As you climbed the last staircase towards Nemo Studios you couldn’t help noticing the coloured light bulb next to a large sign which read: ‘Silence When Red Is On’. It was originally installed to indicate when there was a recording session in progress. A similar sign hung next to the entrance of the control room. In practice the coloured light bulb on the staircase did not work, and often visitors ignored it, entering Vangelis’ studio whether it was turned on or not. 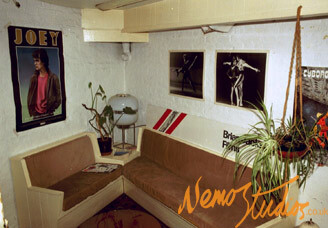 Left photo: The hallway on the top floor just before entering Nemo control room. Another door from the hallway led to the side of the studio's live room. 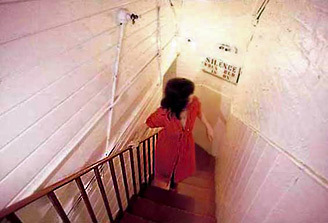 The hallway also led to the lavatories, and to a maintenance room that later was converted as tape storage room. 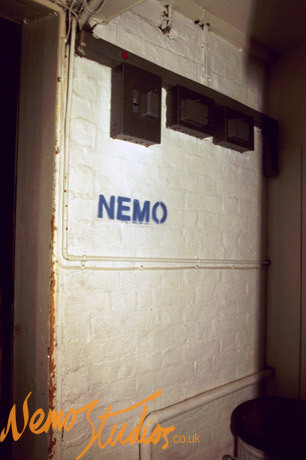 The hallway on the top floor just outside Nemo Studios’ control room. Because the staircase’s well was narrow, large equipment could not be transported into the studio from inside the building, instead, items would have to be crane-lifted in from outside the building and guided through the large window in the control room. Such was the case for large instruments, including Vangelis’ grand pianos. On the few occasions when medium-sized synthesisers had to be taken on a trip or when performing a concert, they would be carried up and down two floors through the stairway, and this included heavy synthesisers such as several Yamaha CS-80s, each weighing 90 kg. 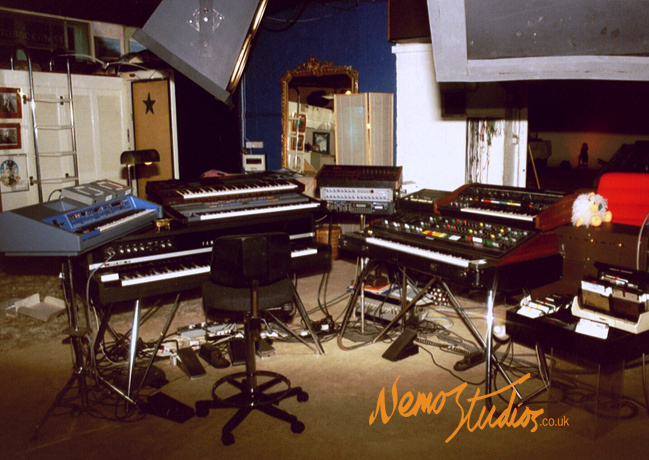 As all of Vangelis’ compositions at Nemo Studios were captured and recorded on analogue magnetic tapes, Vangelis purchased a multitrack tape machine and two mastering 2-track tape machines. 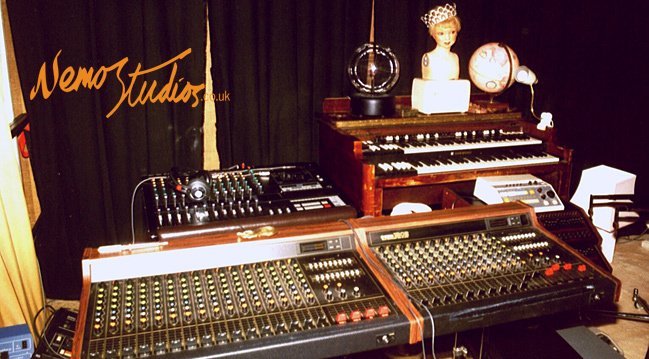 The control room was designated for the synthesisers and the recording equipment. The other, larger, room was the live room seen in the photo as the darker room next to the television screen. 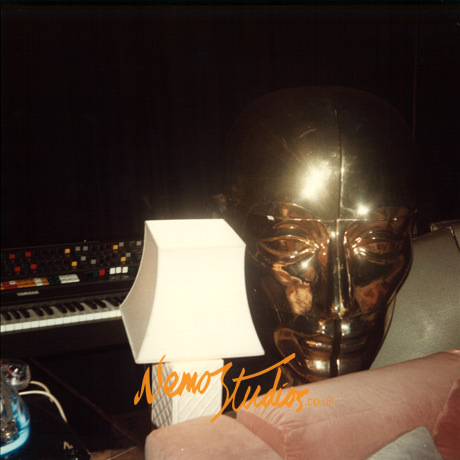 The position of the television would have allowed Vangelis to view the screen when writing the score for a film. Sometimes, a projector screen would be used instead, to show a larger image. The huge synthesiser with the colourful buttons and sliders is the Yamaha CS-80, Vangelis’ favourite instrument. Sitting above the CS-80 is the Emulator sampler introduced in 1982. 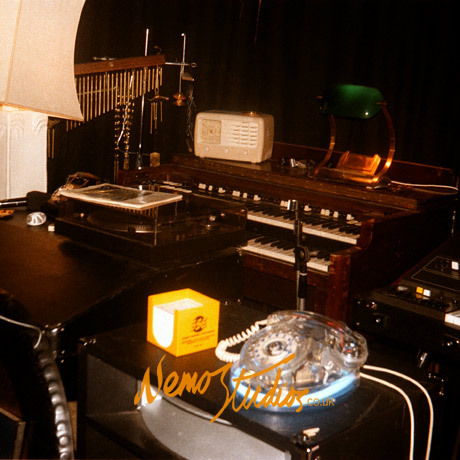 At Nemo Studios the sampler was primarily used for capturing instruments like harps and traditional percussion. The first sampler was the EMU Emulator, followed by its successor the Emulator II. The live room in October 1985. 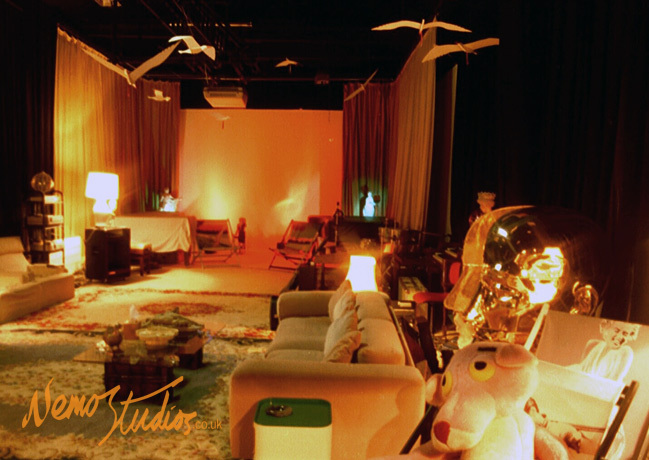 Vangelis’ live room also doubled as a lounge area and a film screening room. Films or rough cuts could be watched on a projector screen, which simulated the cinema experience. During the winter months, a fireplace in the live room kept the visitors in the lounge area warm and cosy. There were also six overhead gas heaters hanging from the ceiling. These provided extra heating during London’s wintery nights. 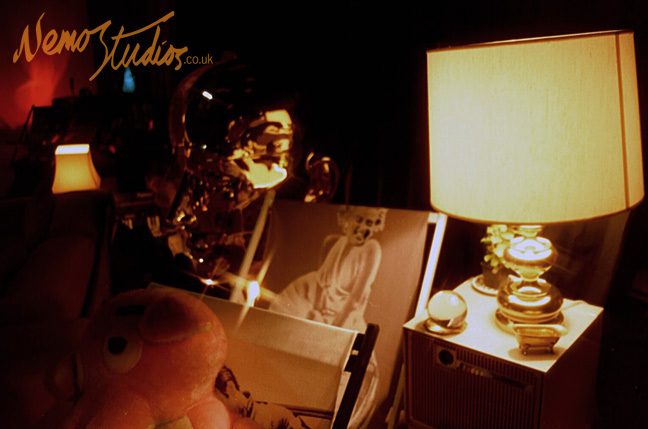 However, these gas heaters were a bit tricky to operate and needed some patience to light, so, as practical measure, some additional small electric heaters were brought into the studio. The live room’ windows were blocked up and the walls and ceilings were painted black. Curtains were hung on all walls. Initially, there were issues with standing waves in the studio. This was not too detrimental to the sound environment inside the studio, but audio rumble affected the neighbouring buildings, which was a particular problem when working late hours at night. The studio’s roof was thin and acted like a huge wooden loudspeaker, which resonated at low bass frequencies. The problem was fixed by adding mass to the ceiling and concrete paving slabs on the roof. Left photo: View of the ceiling of the corner in the live room next to the fireplace and above a small storage room. 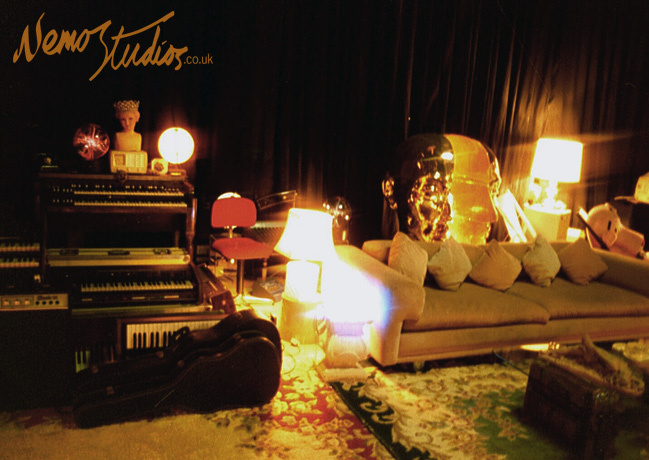 One side of the live room was used to store instruments that were not being used – usually instruments that were two or three years old. If, later on, they were no longer needed, they would be stored at other discrete places in the studio or in storage facilities. 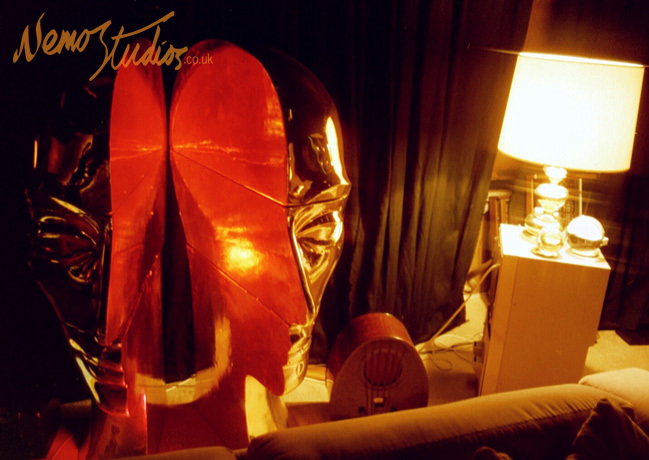 One of the most prominent features in the studio was a 4-foot-high gold lacquered model of a head. 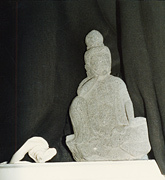 The head was constructed of six moveable parts. It was acquired from a London fashion shop and it always sat in the live room. The artwork from the album ‘Beaubourg’ was based on a photograph of the model’s ear. Typically, telephones were placed at a number of locations in the studio: one line was dedicated for work and a second for private use. 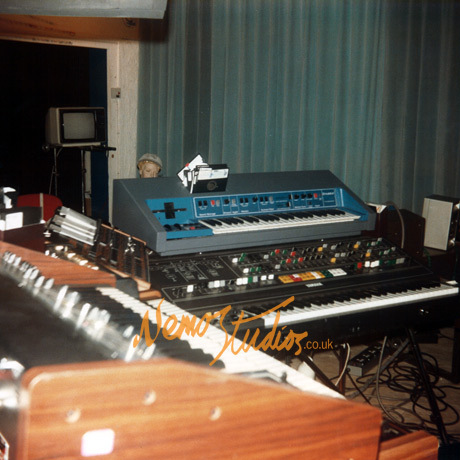 Left: A couple of spare CS-80s, among other equipment in the live room circa 1985, including Vangelis’ old and trusty Hammond B3 organ, which always remained in the studio. Vangelis ended up buying 9 CS-80 synthesisers. He collected them like an art collector acquiring fine art, as each CS-80 had its own character and sound, and during his travels abroad he would made sure to take at least two CS-80s on his trips, one for his personal synthesiser set-up and a spare one for the road or when playing live. 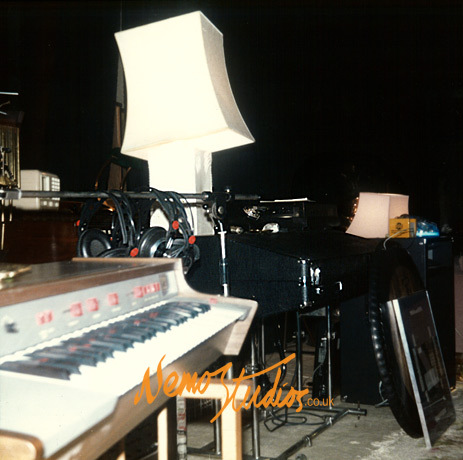 In the late 70’s as synthesisers began to dominate at Nemo Studios, lead by the CS-80 for lead horns and brass, it was joined by the Roland VP-330 that provided much of the string section, and were soon joined by the Yamaha CP-80 sharing the Electric Piano duties with the Fender Rhodes. As well as making music, Vangelis also paints and sculpts. 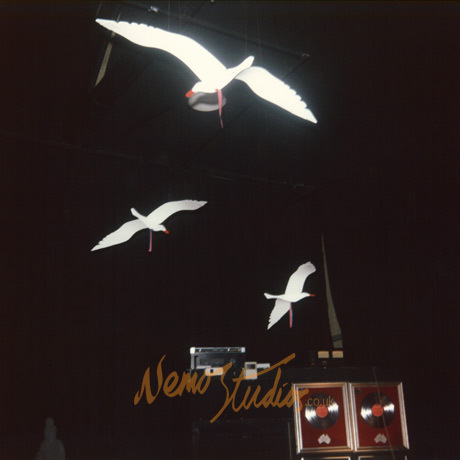 Nemo Studios was filled with many ornaments and statues, but these were not Vangelis’ own works, but ones bought from shops. 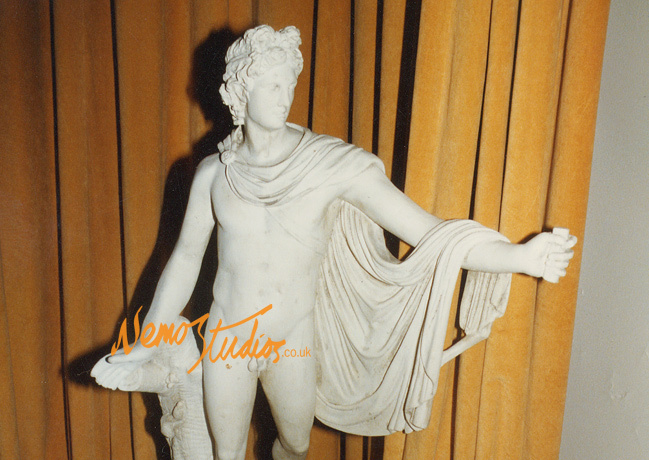 Sometimes, Vangelis would deliberately rough a statue up to make it look older, as if it had been weathered by the elements, or sometimes he would smash a statue into pieces and make something new from it. The back wall of the live room near the cyclorama. 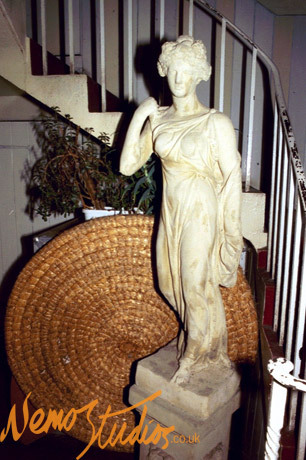 In earlier years a raised wooden stage occupied this space, but it was removed during the studio’s renovations in late 1983. 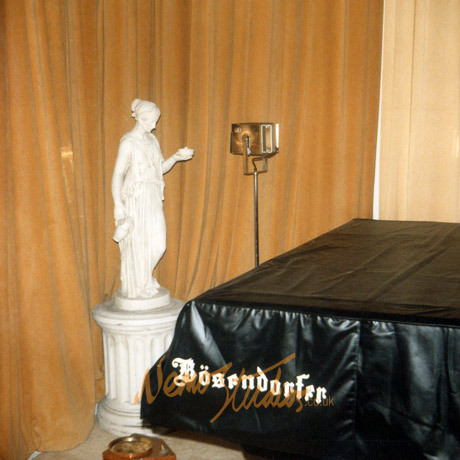 Removing the wooden stage in the live room allowed Vangelis to place two grand pianos at the back wall of the live room, a Bösendorfer and a Steinway & Sons. Vangelis was one of the first people to have an acoustic piano installed with a MIDI interface. However, because of the distance from the piano to the control room and the fact that its keyboard gear was large, it resulted in delayed notes. So another synthesiser set-up was incorporated into the live room, placed next to the piano, and linked to the piano via MIDI, just for the occasion when Vangelis would want to record in this arrangement. Shown is a rack with various video playback machines in the live room. 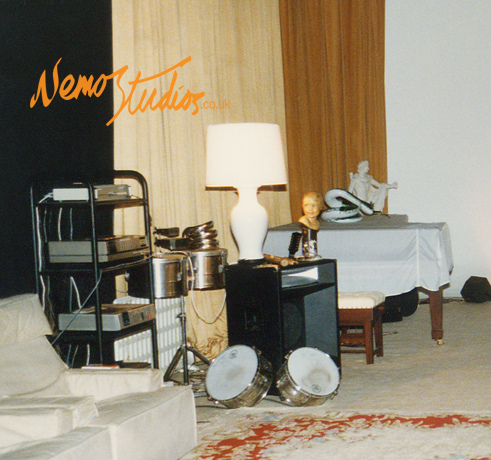 These were used for viewing films and cut scenes which were delivered to Nemo Studios, and formats included VHS, three-quarter-inch video, Beta system and other video formats. 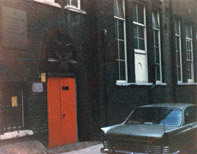 When the building was used as a school, the red doors were the main entrance for the girls and the boys entered via the main door in Hampden Gurney Street. However this later changed when the main entrance in Hampden Gurney Street was designated for both girls and boys. From 1985 onwards, Vangelis spent some time abroad, in Paris, New York, and Los Angeles, and to accommodate his synthesiser set-up, he acquired two Akai MG1212 12-track recorders (one is seen as the black unit behind the two Yamaha mixers.) The Akai came with built-in mixer boards and the two recorders operated with cassette tapes and could be linked in together to provide a total of 24 tracks. This portable studio allowed Vangelis to compose music at his hotel suite, and later the compositions could be transferred to traditional 2-inch, 24-track tapes. A large Pink Panther stuffed toy. The beach chairs were acquired from a trip Vangelis took to the US. Nemo Studios’ floor plan, circa 1982. 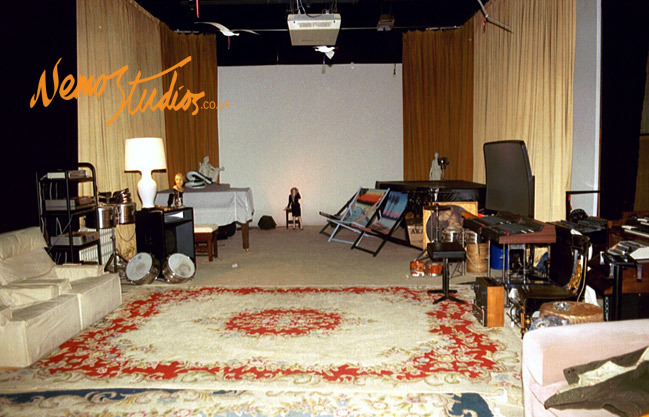 After the studio’s renovations in late 1983, a number of changes occurred to the studio’s layout. The first was moving the tape machines and audio equipment from their current location to the sloping wall just behind Vangelis’ synthesiser set-up. The second was removing the raised wooden stage from the live room, which, in turn, enabled the grand piano to be moved from the control room to the live room. The position and arrangements of the instruments and equipment changed all the time, but, for the most part, the locations of the mixing desk and the Yamaha CS-80 synthesiser remained in the same place after 1978. Certain web pages may be provided with more than one navigation bar to access the next or previous page. The duplicate navigation bars are merely provided for ergonomic reasons, to limit mouse movements across the web page. A page number may be provided at the bottom of the page, with the other page numbers conveniently displayed to enable quick jumps between pages. A photo or a text pop-up window may consist of several pages. If so, a link bar at the top of the pop-up window is provided to access the next or previous individual pop-up pages. Alternatively, all pop-up windows can be navigated by tapping on the left or right arrow keys on the keyboard. Hit the esc key at any moment to close down the pop-up window to return back to the main web page. Navigation via the keyboard’s keys only function during pop-up windows. A photo or a text pop-up may consist of a single page. If so, a close button at the top of the pop-window is provided to close down the pop-up window. Alternatively, hit the esc key to close down the pop-up window. A pop-up photo can also be closed by clicking on the expanded photo itself. When browsing the ‘Discography’ or the ‘Interviews’ section, magazines or records can be thumbed through by using the arrow keys on the keyboard, or via the provided ‘Scroll Bar’ using the touch screen. Alternatively, if using a mouse, the ‘Mouse Wheel’ can be used to thumb through the items by rolling the scroll wheel. To achieve this, place the mouse pointer over the magazine or the disc, then use the ‘Scroll Wheel’ to sift through the items.